Synopsis: The Beautiful Disaster phenomenon continues in the first heart-pounding new adult romance in The Maddox Brothers series. Fiercely independent Camille "Cami" Camlin gladly moved on from her childhood before it was over. She has held down a job since before she could drive, and moved into her own apartment after her freshman year of college. Now tending bar at The Red Door, Cami doesn't have time for much else besides work and classes, until a trip to see her boyfriend is cancelled, leaving her with her first weekend off in almost a year. Eighteen months later, Trenton is living at home with his widower father, and works full-time at a local tattoo parlour to help with the bills. Just when he thinks his life is returning to normal, he notices Cami sitting alone at a table at The Red. As the baby sister of four rowdy brothers, Cami believes she'll have no problem keeping her new friendship with Trenton Maddox strictly platonic. But when a Maddox boy falls in love, he loves forever - even if she is the only reason their already broken family could fall apart. What I Thought: This book made me crazy. I did not figure out the twist until it was literally pointed out at the end of the novel, and I just could not believe it. LIKE ARE YOU FREAKING KIDDING ME? I seriously just sat in bed, unsure what to do next. Like a lost little puppy. 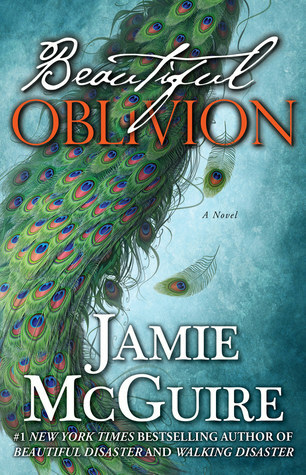 Beautiful Oblivion is Cami and Trent's story, so of course you are going to fall in love with Trent, same as you did Travis. It runs (pretty much) parallel in time with Beautiful Disaster, and you will definitely have some overlaps in time. Cami is a very different kind of girl from Abby, and Trent is very different to his brother too - so don't expect to be reading the same sort of story. Trent is in love with Cami, and has been for awhile. Cami has a boyfriend and knows well how the Maddox brothers work. So of course, they try to be friends. And of course, that never really quite works out how they expect. Cami's boyfriend (and for me, the mysterious job he works) is the secret that shakes up the story the entire way through, and if like me, you don't figure it out then, like me, you will be shocked. Trent and Cami are completely adorable and lovable, and the few new characters we meet, you will love just as much. McGuire really has a unique way of telling stories, so if you loved Beautiful Disaster then you are certainly going to love this one too -and if you haven't read BD, then I suggest you give this one a crack anyway! The Good: The killer twist at the end! The Bad: Also, the killer twist at the end!